Ana signifies nosoul, alone. No one has ever been there to help Ana or teach her the ways and practices that have existed for thousands of years. Li--Ana's mother and guardian--makes sure she gets as little exposure to the public as possible but when her eighteenth birthday finally arrives, Ana decides to venture to the center of it all; the one place where she might find some answers for her existence, Heart. When she takes a wrong turn and ends up going in the opposite direction of her destination, she's put into a near-death situation but is unexpectedly rescued. Sam saves her, but seeing as how this is the first time anybody has tried caring for Ana, she's understandably hesitant to trust him. One thing binds them together though, music. With the help of Sam and his friends in Heart, the encompassed white-wall enclosure where most of the population lives in Range, Ana is able to live with him and allowed to explore their libraries to learn more about how the million souls, under the rule of the Council, live. My first impression of Ana's character was that she had trust issues and questioned everything about the way the oldsouls lived. Ms. Meadows goes into her story head-on but throughout the book, she unveils the reasoning and thought process for Ana's decisions and attitude. I grew to like her brave impulsiveness and polar opposite personality from Sam. She definitely grew into her own person even if she didn't see that herself at first. Sam was a sweet love interest that indulged Ana more than he probably should have. His protective and hesitant nature flourished due to Ana's influence and vice versa. They both developed simultaneously and learned from each other. I liked reading about the other characters involved in the Ana's life as well. I appreciated their roles and how they reflected on Ana's life but I could also see how their individual lives were part of the million souls. The secretiveness and distaste behind Ana's existence is evident from the very beginning. Ana's quest to find out more about her raison d'être takes hold of the story's plot line as does the intensity behind her relationship with Sam. I had some problems while going through the book because I wanted more of the technological background for the oldsouls, less to do with their feuds with dragons and all the other mystical creatures and more about how they live, what their individual jobs are, how the Council makes its decisions and keeps track of everything. All of these elements are mentioned but never truly gone into depth about. The only truth given for Heart's creation was that a being named Janan supposedly built it for the humans that were being reincarnated. And what bothered me the most was the mysterious structure that stuck out like a sore thumb in the book: the temple. We only get the answers and reason behind the temple's creation towards the end of the book and even though, I was so confused I was getting wrinkles. All the answers that Ms. Meadows was trying to give at the end had too many gaps and just left me frustrated and wanting to shake the book--in this case, my Kindle--for more thorough explanations. Another smaller issue I had a problem with was how the climate and time-telling inside heart was different than outside the walls. This also leads to my problem with how one year is called the Year of Drought, the next the Year of Souls. There's no explanations for the cycles or when they know another Year of Souls is coming up. 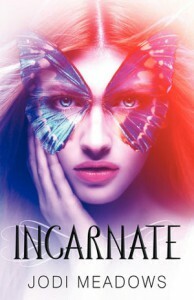 I will be reading the sequel for Incarnate just to follow along and see if I can get some answers to my questions and that will be what determines if I read the rest of the Newsoul series. I do recommend picking up Incarnate because of its originality and new twist on the ever-growing popularity of the dystopian genre.